This Bexley job by Outside Concepts Sutherland involved enclosing an existing patio area with ziptrak blinds. Sounds simple. Yet without the magic provided by the ‘Galaxy’ black ShadeView 300 from the Shade Elements Urban collection, this job wouldn’t look half as good. That’s because ShadeView fabric comes in generous 3 metre lengths to allow for extra wide widths without seams! Two of the blinds installed on this job were just over 4m wide. 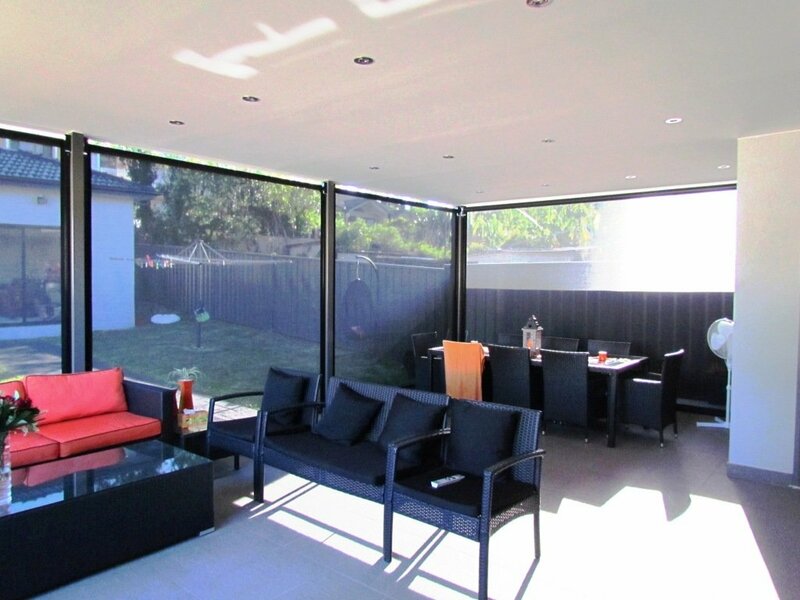 ShadeView 300 is wide, strong and has more protection from the sun having an openness factor of 5%. It up for the toughest of jobs, even blocking that fearsome summer sun on the western side of the house. Imex has a lot of information on its ShadeView site and it’s well worth looking at How to choose your fabric section. Our customers were so happy with their newly shaded outdoor living space they treated the boys to a wonderful Lebanese BBQ followed by a hubbly bubbly! Pure magic!